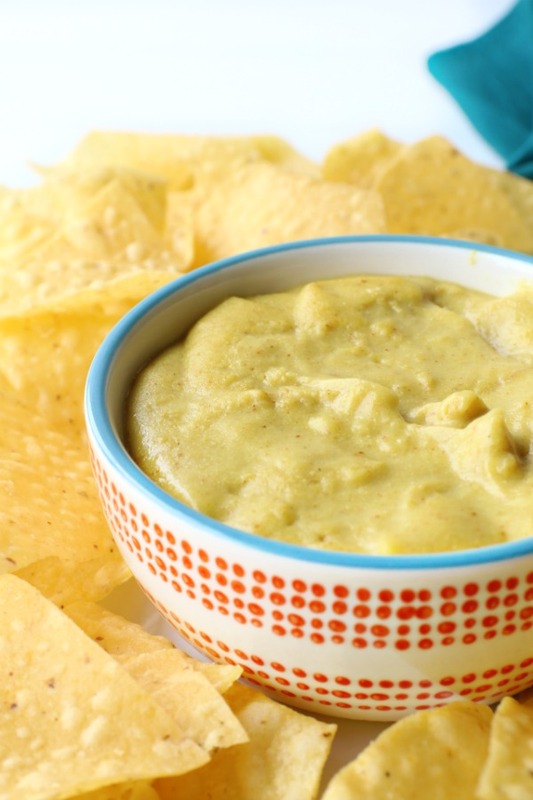 This vegan cheese sauce is so ooey gooey and stretchy! Perfect for Nachos, Pasta or Mac & Cheese. This simple Vegan Cheese Sauce comes together in just 5 minutes and is made with simple ingredients. It’s easy to make, gooey & melty and everything you’ve ever wanted in a sauce! Best of all, it’s nut-free which makes this allergy mama happy. All this cheesy goodness comes from The Veginner’s Cookbook by Bianca Haun and Sascha Naderer. They are the power couple and blogger’s behind one of my favorite blogs, Elephantastic Vegan. What I love about this cookbook is that it’s perfect for anyone, whether you’re a veteran vegan, a new vegan, or vegan curious. It takes their first hand knowledge of transitioning to a vegan lifestyle to help others. You’ll find helpful information on how to answer questions from family or friends, tips for ordering at restaurants, learning vegan swaps and time-saving tricks. They really want to help you succeed in your plant-based diet. 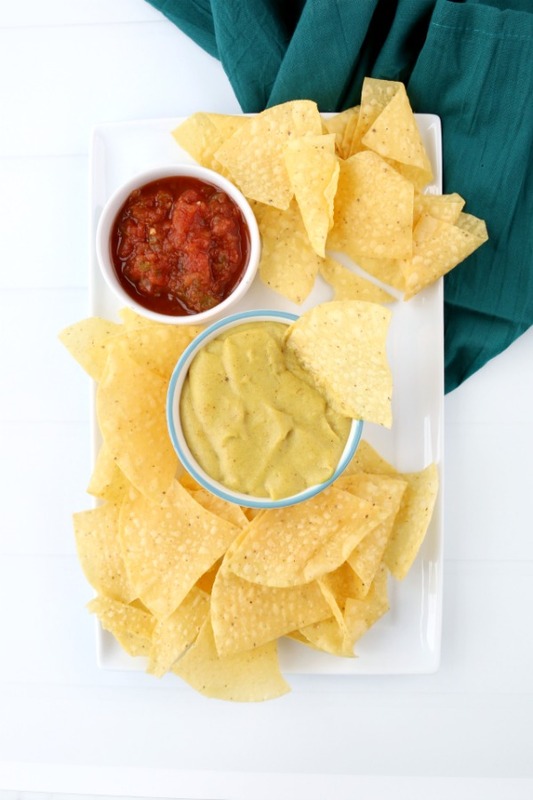 The Veginner’s Cookbook also includes seventy-five vegan recipes that will help you navigate the plant-based lifestyle like a pro, including this delightful vegan cheese sauce, which is perfect for dipping your favorite nacho chips into. Of course you can also use it to mix into your pasta bake, layer between lasagna noodles or drizzle all over your papas nachos. The reason I chose to share this recipe out of all the others is simply because most of the non-vegans I talk to swear that they cannot give up cheese. Well, thankfully when you have awesome products on the market and recipes like this, it makes ditching the dairy a whole lot easier. But let’s not forget the other recipes! 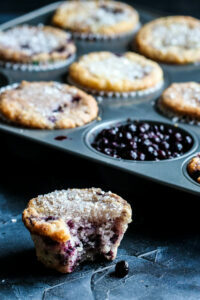 Breakfast, Bread, Sauce, Party Foods, Main Meals and Desserts….it’s all there with beautiful photos to lead the way. 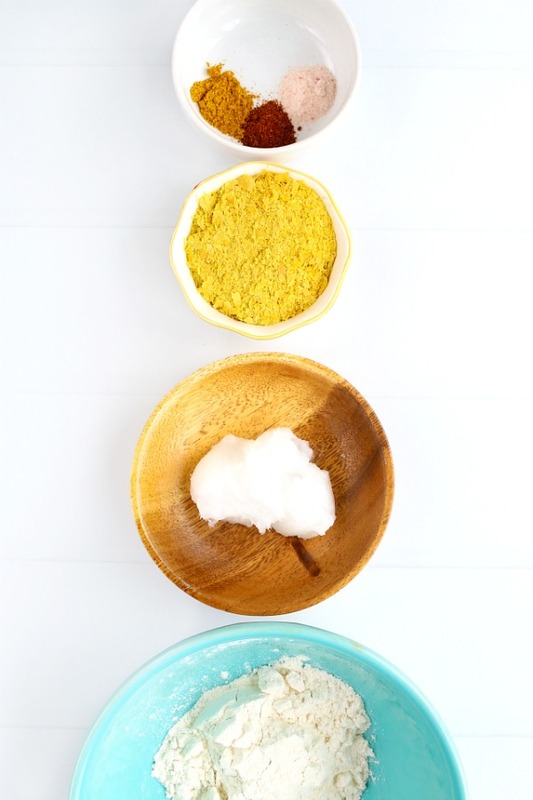 The list of ingredients are pretty simple, in fact, you probably have most of these if not all of them in your pantry already! Did you notice the ingredients did not call for nuts of any kind? That’s right, this is a nut-free recipe, so if you’re allergic to nuts, then this sauce is for you! One of the most difficult things for our own personal diet is that not only have we gone vegan (no dairy, eggs, or animals) but we also cannot do nuts (AT ALL) and I cut back on gluten due to some other issues. That being said, there’s a lot of label reading or making from scratch going on. 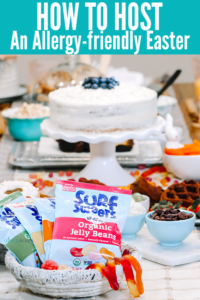 Because I know many of you have multiple restrictions as well, I made sure to try this recipe using Gluten-free flour instead of all-purpose. It was a success ya’ll! 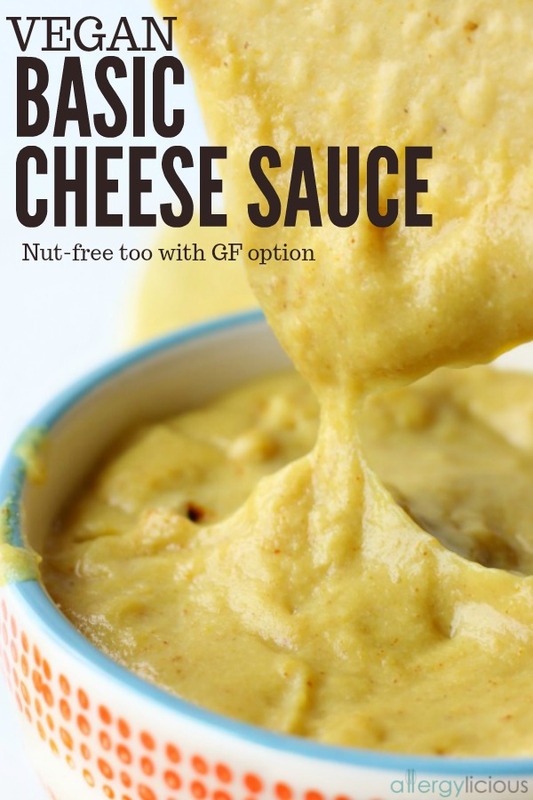 No dairy, no nuts and no gluten in this yummy sauce. Are you ready to get your sauce on? What will you try it on first…..nachos, noodles, veggies? 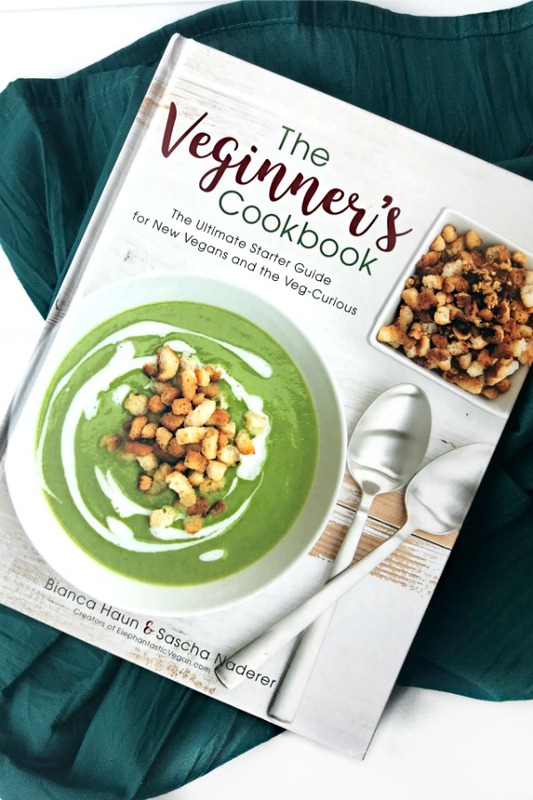 Let me know in the comments below and don’t forget to order your copy of The Veginner’s Cookbook here. 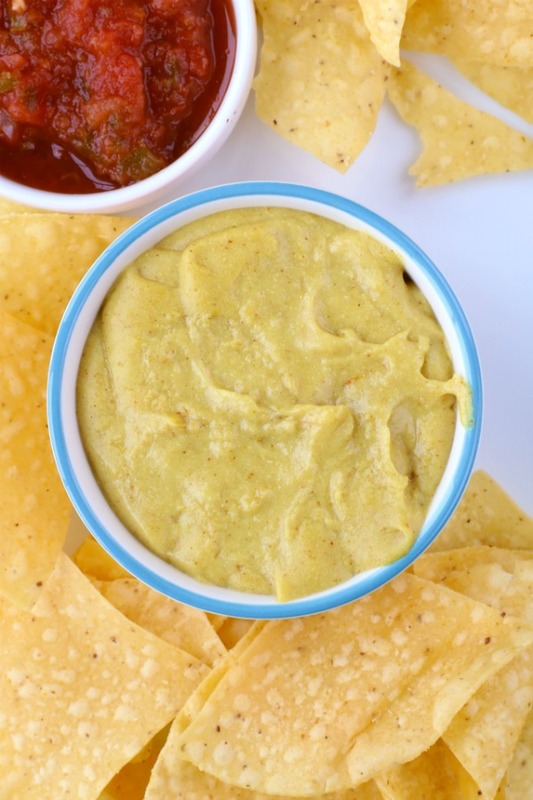 This sauce is perfect on pasta, pizza, mac & cheese, or as a dip for your favorite nachos. It’s easy to make and everything you’ve ever wanted in a sauce! Heat the coconut oil in a small pot on low heat. Once the oil is a complete liquid, add in the flour and whisk. Add the salt, paprika powder, and curry powder and whisk again. Then, add the nutritional yeast and whisk again. It should be clumpy–that’s normal, don’t worry. Add the water and whisk on the lowest heat setting for about 1 minute until the sauce thickens nicely. If it gets too thick (or if you want to reheat at a later time) you can add a little more water and whisk again and it should be good as new. Use it as a dip, pour it over some lasagna or pizza or whatever you like. 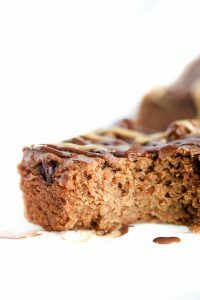 *The original recipe calls for AP flour but I made this with All Purpose Gluten-free flour which turned out wonderfully. Be sure to adjust the liquid accordingly if you use a different flour (I had to add about 1/2 cup extra). I received a free copy of The Veginner’s Cookbook in exchange for writing a review. As always, all thoughts and opinions are my own! My sister is vegan and has had a hard time giving up cheese. I will need to send her this recipe! I will certainly be trying this recipe. The spices make my mouth water! The spice is delightful. I’m going to try using taco seasoning and chili powder next time for our nachos. Ok. I bought nutritional yeast and have not used it yet. I guess it is time to give it a shot and make this cheese sauce. I’m not vegan nor dairy free, but a little less dairy cheese in my diet may be a good thing. I’ve been loving this book. Such classic easy recipes! This cheese sauce is fab! Then you’ll be a huge fan of this sauce. I can’t believe you can make vegan cheese sauce that actually looks like cheese lol! I really want to try this. I know, right? I never would have thought it was possible when we went dairy-free 10 years ago. I need to check out her book. Looks like a winner – just like this recipe! It’s a great cookbook and the recipes are so easy to make. If you have a nut-allergy, you have a few to modify, but thankfully its not heavily nut based for us. it is so hard if you have to be dairy free and nut free but this recipe looks amazing, you should try adding roasted carrots, it would totally add some extra flavor and it can switch up the flavor profile so you get a little variety. Hey Andrea, love the recommendation of adding roasted carrots. In my mac & cheese recipe on the blog, I use roasted butternut squash which does add that extra flavor profile. Wow! What an awesome book! I need to check it out and that cheese looks so CREAMY! It’s hard to believe it’s vegan! It’s very creamy and the perfect fix when you need/want something cheesy. Thank you so much for the awesome review, Nicole! I’m so happy to hear that the cheese works with gluten-free flour as well. Yeay! Of course Bianca! The cheese sauce was a huge hit! I bet it tastes amazing in Mac & Cheese. We’ll try that next. I love Bianca and Sasha’s book! I reviewed it as well, but I haven’t gotten around to trying their cheese sauce. Thanks for the review and for reminding me to make that sauce!